Samuel W. Barrick was born on September 27, 1924 in Woodsboro, MD to the late Harry W. and Marie S. Stambaugh Barrick. His formative years were spent in Woodsboro where his family owned SW Barrick & Son, Inc., a lime and stone business. He is survived by his wife of 68 years, Joan Johnson Barrick; and three children, Linda Barrick Lebherz (Charles), Paul W. Barrick, and Mark W. Barrick (Wendi); six grandchildren, Sarah Barrick Starr (Ian), Samantha Barrick, Lucas Kline, Joanna Kline Mooney (Derek), Allison Barrick and Sean Barrick; four great-grandchildren, Chad, Lena, Lorelei Mooney and Stella Starr. His sister, Betty Wachs; and sister-in-law, Rebecca B. Barrick; he is also survived by numerous nieces and nephews. He was preceded in death by sister, Bradley Barrick Thomas and husband, William; brother, Harry W. Barrick, Jr.; and brother-in-law, Ernest V. Wachs. Judge Barrick graduated from Frederick High School in 1941 and attended Mercersburg Academy. He enlisted in the Air Force and served as a navigator on a B24 in the European Theater. After WWII, he attended Gettysburg College graduating in 1948. His decision to enter MD Law School in 1949 was life changing and opened him to the world of politics. He graduated in 1952 having attended night school and taking classes during his lunch hour. He began his law practice after graduation. In 1954, he was elected States Attorney for Frederick County which he served a four-year term. In 1958, he was elected States Senator for Frederick County also serving a four-year term. After leaving the Senate he continued his successful Law Practice and was appointed county attorney. He was elected to the Frederick County Committee to attend the infamous Chicago Convention in 1968. In 1969, when the circuit court judge position became available he decided to run for Judge where he was elected in the primary winning both the democrat and republican votes. 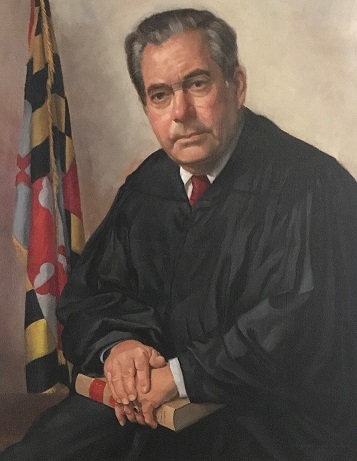 In 1970, he took office serving 15 years as a judge of the circuit courts of Frederick and Montgomery Counties. Judge Barrick was active and served on the boards or as president of many community and business and charitable organizations during his long life. He was an active member of the Evangelical Lutheran Church in downtown Frederick. Serving in many capacities such as; church counsel and as a Sunday school teacher. Judge Barrick participated in a variety of sports, golfing being his favorite, along with tennis and waterfowl hunting on the Eastern Shore. Upon his retirement, in 1985, he and his wife began to travel extensively during the next 20 years. They visited many countries using many different means of travel. They also spent their winters in Naples, FL, but always returning to their farm in Frederick which he enjoyed. The family will receive friends from 4 to 7 p.m. on Friday, April 19, 2019 at Stauffer Funeral Home, 1621 Opossumtown Pike, Frederick for a celebration of a life well lived. There will be a private funeral service for the family. In lieu of flowers, memorial contributions can be made in his name to the charity of one’s choice.